(UPI) — The United States withdrew from the 1955 Treaty of Amity which normalized relations with Iran, Secretary of State Mike Pompeo announced Wednesday. The move came after the UN’s International Court of Justice (ICJ), also known as the World Court, ordered Washington to ease sanctions on Iran so that humanitarian goods can enter the country again. [Following a complaint brought to the Court by Iran], the Netherlands-based court ruled that necessary medicines, medical supplies, food and agricultural products should be allowed into Iran. Earlier this year, the United States imposed sanctions to compel Iran to agree to a new nuclear deal. [President Trump had withdrawn from the controversial Iran nuclear deal President Obama made in 2015 without congressional approval, bypassing Congress by calling it an executive action instead of a treaty.] . 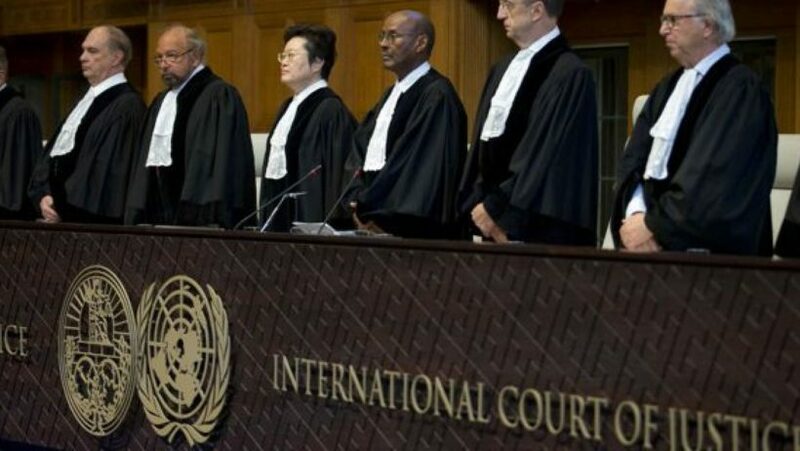 “The court considers that the United States must remove, by means of its choosing, any impediment … to the free exportation to the territory of Iran of goods required for humanitarian aid,” said ICJ justice Abdulqawi Yusuf. Wednesday’s decision marks the first time the ICJ, also known as the World Court, has intervened on sanctions against another country. The court said in its 29-page ruling the U.S. sanctions violate the Treaty of Amity, which was established a quarter-century before Iran’s Islamic revolution in 1979. “The decision proved once again that the Islamic Republic is right and the U.S. sanctions against people and citizens of our country are illegal and cruel,” Iran’s foreign ministry answered in a statement. The sanctions have caused Iran’s economy and currency to decline sharply, and a new round of penalties to limit oil exports take effect in November. Countries will be prohibited from buying Iranian crude oil exports. The court’s decision is binding, but it has no power to enforce it. The United States left the International Court of Justice more than a decade ago. 2. Why did Secretary Pompeo withdraw the U.S. from the treaty with Iran? What did he note about the decision? 4. a) What is the ICJ? b) What has the Trump administration said/done about ICJ jurisdiction over the U.S.? 5. What is unusual about Wednesday’s ICJ decision regarding the U.S.? 6. a) During his address to the UN General Assembly last week, what did President Trump call on member countries to do regarding Iran? b) Read the “Background” below the questions. Why does the U.S. (and many other countries in the region) want Iran to end its pursuit of nuclear weapons? 7. a) What effect have U.S.-led sanctions against Iran had so far? b) Ask a parent: Do you think U.S.-led sanctions will be effective in pushing Iran to end its quest for nuclear weapons? Please explain your answer. a) Do you agree with these principles? Explain your answer. b) Watch Secretary Pompeo’s remarks in the video under “Resources” below. What do you think about U.S. response to the ICJ attempting to tell our government what actions we are allowed to take in regards to our foreign policy? (Agree, disagree?) Explain your answer. Iran’s 20 year secret nuclear program was discovered in 2002. Iran says its program is for fuel purposes only, but it has been working on uranium enrichment which is used to make nuclear bombs. The world knows the Iranian regime is lying. The Iranian government has called for “Death to America” and for the destruction of Israel on numerous occasions. It is believed that once obtained, Iran would use nuclear weapons against Israel. At a White House briefing later Wednesday, National Security Adviser John Bolton announced the United States is also withdrawing from the optional dispute resolution process to the Vienna Convention on Diplomatic Relations. Bolton said that decision was made in connection with a case brought by the “so-called State of Palestine” over President Trump’s decision to relocate the U.S. embassy in Israel from Tel Aviv to Jerusalem. The United States will still participate in the underlying Vienna Convention, he added. Bolton cast the decisions on the Vienna Convention and the Iran treaty as in line with [Trump administration policy that the International Criminal Court [has no control or jurisdiction over U.S. sovereignty]. The national security chief also said the administration would examine any international agreement that exposes it to litigation under the ICJ. 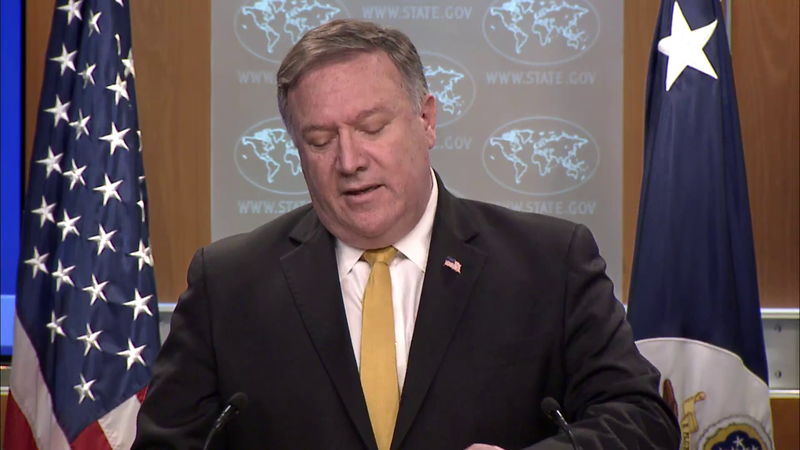 In addition to announcing the termination of the treaty, Pompeo upped the pressure on Iran over its alleged activity in Iraq. Last week, Pompeo ordered the closure of the U.S. consulate in Basrah, Iraq, alleging the militias under the direction of Iran are targeting the consulate. On Wednesday, Pompeo said U.S. intelligence “is solid” that Iran is the origin of attacks on the mission in Basrah and the U.S. Embassy in Baghdad, without elaborating on the intelligence. The heightened rhetoric comes as the United States prepares to reimpose the rest of the sanctions that were lifted as part of the nuclear deal. The Trump administration set a Nov. 4 deadline to reimpose those sanctions, including on oil sales, after Trump withdrew from the accord in May. Pompeo said Iran is “clearly” worried about the U.S. pressure campaign against Iran following the withdrawal from the nuclear deal.